Like The Datai Resort, The Andaman too follows the same theme of seclusion and a peaceful vacation in an unspoiled serene atmosphere. 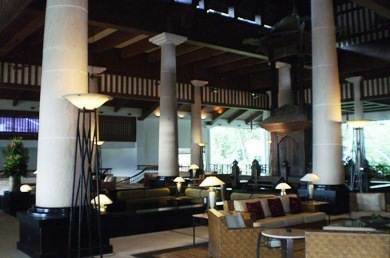 The Andaman is located close to The Datai in Datai Bay area at the north western end of Langkawi. It takes about 30 minutes drive from the airport. As you drive along the road Jalan Datai that runs by the northern coast line, The Andaman will come first and soon after that The Datai. In fact these are the only two hotels and establishments in this locality. You won't find any shops or restaurants within 20 kms... you can well understand the level of isolation this resort offers. But additionally The Andaman makes some unparalleled offerings. The surrounding rainforest with animal life and the private Datai Bay beach at the bottom of the sloping hill are probably the two most stunning boons that you get here. The Andaman is nestled deep into the rainforest and you can see wildlife like giant squirrels, monkeys, monitor lizards and even flying lemurs in the jungles surrounding the resort. And the private beach here means no noisy jet skis to break the peace. So if you are looking for a luxury vacation in complete isolation while being surrounded by mother nature, then The Andaman Resort can be an excellent choice. The main lobby is at the ground level. The giant tall white pillars rise from the floor to the wooden ceiling. The cushioned comfortable wicker sofas are great for relaxing. The moment you step in, the friendly and all smiling staffs will make you perfectly at home, at least that's how I felt when I was picked up at the airport by the hotel car and dropped at the reception. And the all-friendly service begins with the General Manager Anne Scott who leads from the front. They are very accommodative. If you don't like something, just spell it out. And they will go out of their way to solve your problems. In fact when we requested for a change in room, it was done almost in no time. The resort is on a hilly slope where the facilities have been built up at different levels down the hill and finally the private beach is at the foothill which you can reach through the resort area. There is no public access to the beach. The Andaman has 186 rooms of several different kinds like the Deluxe Rainforest Rooms with great rainforest view, Deluxe Treetop Rooms overlooking the rainforest treetops, Lanai Terrace Rooms with great sea views, Garden Terrace Rooms with private rainforest garden terrace, Deluxe Seaview, Luxury Pool Access Rooms and Executive Suites. Most rooms are 43sqm in size and quite spacious. The standard in-room amenities includes WiFi, LCD TV, iPod docking station, fully stocked mini bar, air conditioning, personal safe, etc. Andaman does offer plenty of dining options and the chefs have been extremely passionate in preparing the dishes with utmost care. Over the several days of our stay in the resort, we observed that the food was consistently good in all its restaurants and service excellent. 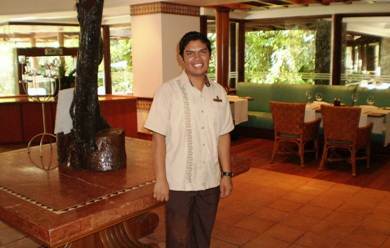 The Restaurant, one of the main dining venues in the resort serves international cuisine. In breakfast you will get both American and Continental buffet, and also ala carte. The atmosphere inside is elegant yet casual and friendly. It can seat 180 persons and has both indoor and outdoor seating. Try out the Ayam Bunga Kantan - chicken curry prepared with local herbs. 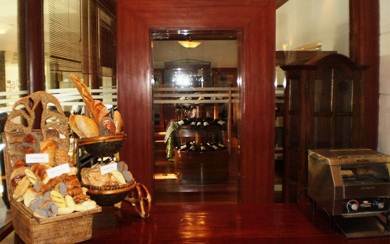 One of my favorites here is the Wine Cellar where you can have an intimate private dining. The cellar room stocks great selections of fine wine. The Humidor cabinet in the restaurant stocks great collection of cigars including Cuban, Jamaican etc. The Restaurant is open from 6:30 am until 10:30pm. It's located at the ground floor and overlooks the pool. Another great dining option is The Japanese Restaurant located in the ground floor and overlooking the lush rainforest by the poolside. From a window-side table, if you are lucky you can even see flying lemurs gliding through the trees. 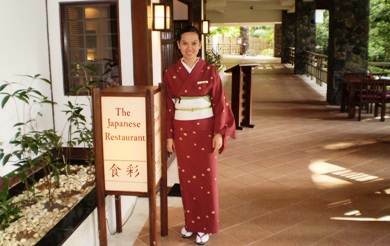 The restaurant serves authentic Japanese cuisine like a range of Sushi, Sashimi and Tempura dishes. There are couple of Teppanyaki counters where you can take part in grilling the food on the hot plate. 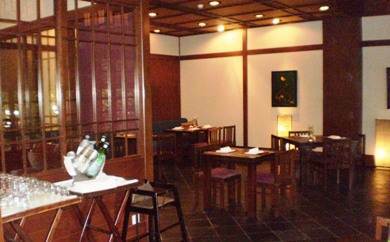 The restaurant also has Tatami Rooms for traditional Japanese style dining. It serves only dinner (7pm to 11pm). Tepian Laut is a poolside restaurant serving nice international and Malay cusine. They make wood fired pizzas, homemade desserts and several different types of local dishes. Great place to have a cocktail or some beverages while enjoying the surroundings. open from 11am to 10:30pm. Jentayu Lounge is located at the Lobby level. You can take a comfortable seat and get immersed in the view outside. 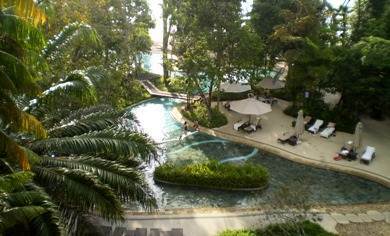 You get magnificent view of the lush rainforest ahead and then the Andaman sea beyond meeting the horizon. Do not miss the amazing view of the sunset from here while enjoying a cocktail. 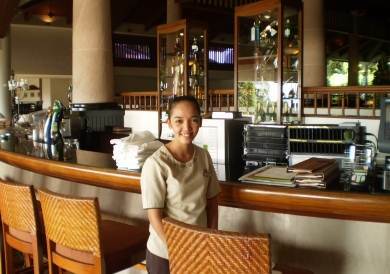 The Beach Bar serves light fares and international cuisine. In the evening, you can select from the fresh catch of the day and the chef will prepare it according to your choice of cooking style. The happy hour is from 5pm to 6:30pm. It's a great place to enjoy the sunset with a cocktail. The private beach at The Andaman - Datai Bay beach has been rated as one of the 10 best beaches in the world by National Geographic. A pathway through the rainforest leads to the V Integrated Wellness Botanical Spa, a specialty spa which is the first in the whole of South East Asia offering 100% organic food grade products. It offers award weaning treatments like "Chi Tsang" and Gem Stone Facial, Kahuna Wave Massage etc. Several of its massages and rituals are inspired by the traditional Malay massage leveraging rainforest based ingredients. The spa is perched on a hill side with lovely view of the Datai Bay and the Andaman ocean beyond. The Fitness Center is one of the largest in the island and has all kinds of modern gym equipment that you may ever need. The resort has a lagoon style swimming pool with a waterslide for the children. It's located by the beach side. The Bamboo Cineplex on the beach shows popular movies on Sunday evenings on large screens. The Andaman organizes several non-motorized water sports from its beach like kayaking, windsurfing, hobie cat boating etc. It also organizes day and sunset sailing cruises from the Awana Porto Malai Terminal at Pantai Tengah. It takes 40 minutes to reach the cruise jetty. You can take a complementary mountain bike to explore the trails of the rainforest with its diverse flora or fauna, or just go for jogging. The resort also organizes a series of Nature Activities. The rainforest is home to many amazing plant and animal life including dusky leaf and macaque monkeys, flying lemurs, monitor lizards, geckos and some 300 species of birds including the great hornbills. The nature tours include Rainforest Walk in the morning (complementary), exploring the rainforest after dark to see amazing activities of nocturnal animals, Geopark & Mangroves Boat Tours, Jungle Trekking, Bird Watching and lot more. Expert and knowledgeable guides will accompany you. after having discovered a coral reef near its shore which is some 6,000 years old, The Andaman Resort has embarked in a nature activity of removing dead corals, salvaging damaged corals and restoring them back into the reef. They have opened a Coral Nursery where even the guests can participate in Coral restoration process. Young Explorer's Club located at the ground level and next to The Restaurant is the hub of activities for the children. While there are educational programs around nature, the kids engage in various other activities like nature drawing, beach walk, photo shoot, beach bowling and many different kinds of games & activities. For business meetings, the resort offers meeting rooms and board rooms with full facilities. The Andaman also offers wedding packages along with its unparalleled beachside wedding venues.